Every once in a while I get into discussions with various people about computer programming concepts such as objects, classes, data-types, methods, and functions. Sometimes these discussions result in questions about the definition of these terms from those who have some programming experience, and sometimes these questions come from those who have no background in computer science or familiarity with programming terminology whatsoever. I usually attempt to answer these questions using various metaphors and concepts that I feel the individual or group may be able to relate to. It is quite possible that even my own understanding of these concepts may be incorrect or incomplete in some way. For the sake of reference and consistency, I am writing this brief article to explore these concepts in the hope that it will provide clarity into their meaning and purpose. So, what is a data-type? Some languages, like C, have a strict set of data-types. Other languages, like C++, and Java offer the developer the ability to create their own data-types that have the same privilages as the data-types that are built into the language itself. A data-type is a strict set of rules that govern how a variable can be used. A variable with a specific data-type can be thought of in the same way as material things in the real world. Things have attributes that make them what they are. For example, a book has pages made of paper that can be read. A car is generally understood to be an automobile that has four wheels and can be used for transport. You cannot drive a book to the grocery store, in the same sense that you cannot turn the pages of a car. A data-type is a specific set of rules for how a variable can be used. In languages like C++, there are core data-types such as the ones found in C. However, C++ also offers developers the ability to create their own data-types. Providing developers the ability to create their own data-types makes the language much more flexible. We more commonly refer to a user-defined data-type by the more popular term, class. In C++, a class is a user-defined data-type . That’s all it is. It provides the developer the ability to create a variable (or object) with specific attributes and restrictions, in the same way that doing “int dollars = 5;” creates an object called “dollars” who’s attribute is to have a value which is strictly an integer. In the real world, a five-dollar bill cannot be eaten (technically), and it cannot be driven like a car to a grocery store (even though that’s where it will likely end up). An object is a variable that has been defined with a specific data-type. A variable is an object when it is used as an intance of a class, or when it contains more than just data. An object in computer programming is like an object in the real world such as a car, or a book. There are specific rules that govern how an object can be used which are inferred by the very nature of the object itself. The nature of computer programming means that developers have the ability to redefine objects, for example making the object “book” something that can be driven. In the real world however, we know that you can call a car a book, but it’s still a car. The core understanding of what a car is has been ingrained within us. Although “car” is simply a three letter word (a symbol, or label), there are too many people and things in the world that depend on the word “car” having a specific definition. Therefore objects in the real world cannot be as easily redefined as their counter-parts in computer programming (however, it is still possible ). So what is a method? In computer programming, we have things called “functions”. A function is an enclosed set of instructions which are executed in order to generate (or “return”) a specific result or set of results. You can think of a function as a mini program. Computer programs are often created by piecing together multiple functions in interesting and creative ways. Functions have many names, and can also be referred to as subroutines, blocks and methods. A method is a function which is specifically part of a class, or a user-defined data-type, which makes a method an attribute of an object – something that the object is capable of doing. Just like in the real world, methods can be manipulated and redefined for an object, but not for that object’s base class. A book can be used to prop-up a coffee table, but that does not mean that books are by definition meant to be used in this way. I’m not really sure where I was going with all of this, but the above should be sufficiently lucid. I was motivated to write this after recently referencing Bjarne Stroustrup’s “The C++ Programming Language”. If you’ve ever asked yourself the question “what is an object?” or “what is a class?”, then the above descriptions should serve as a useful reference. “The C++ Programming Language – Special Edition”, page 224. For example, the definition of “phone” has been redefined several times in recent history, from the concept of a dial-based phone, to cell phones, to modern smart-phones. I’m tired and a bit wired, but I figured I’d put a few words together just to purge my messy mind. So today I’d like to talk about presentation software (a la powerpoint); mind-mapping software, and how to get from one to the other in an interesting way. I’ve been a mind-mapping fanatic for many years, as far back as 2004 if I recall correctly. Back then (and even up to today) I’ve used and loved the free and open-source mind-mapping software called Freemind [http://freemind.sourceforge.net/wiki/index.php/Main_Page]. It’s a great little piece of java software which provides a great UI for doing brainstorming and outlining using mind-maps. These days, I use a mix of Freemind and XMind to do my day-to-day brainstorming and planning. XMind is like Freemind (in fact, I’m sure it borrowed many ideas from that project), but has a nicer UI, and many more options in terms of layout, tagging, markers, etc. I find that I jump between the two often, until my brainstorming takes on a life of it’s own, then I will stick to one or the other for the remainder of the map creation. I recently had to put together a presentation for the Toronto Perl Mongers group to discuss, well Perl.. and VMware. And of course I whipped out Freemind and XMind to start the brainstorming process. XMind has a nice feature that allows you to export your mind-maps to an MS Power Point or OpenOffice Impress type format, which is great and what I needed. Problem is though that this feature is not free, it comes as part of XMind’s online subscription services for their “professional” version of the product. Even though the price is fairly reasonable, and I’m sure at some point may just bite the bullet and subscribe, I wasn’t ready to do that just yet. So I was on the hunt for some way to convert my mind-map into some kind of presentation. To their credit, one thing that XMind does do properly is allow you to export your XMind maps to Freemind’s .mm format. This is great, because Freemind itself has multiple freely accessible export formats, including exports to OpenOffice.org and PDF. However, I wasn’t satisfied, I was looking for something that would do the job more completely. So I went hunting on the plains of Google to see if anyone was experiencing the same problem I was, and if they did anything about it. And what do you know! I found a project on Google Code that does exactly that! The project is called (reasonably enough) mm2s5, and does a wonderful job at converting my Freemind mind-maps into S5 Presentation format! Anyone who’s interested in finding a nice way to brainstorm and turn their ideas into presentations should seriously consider trying these tools out, they’re fantastic, and they’re free! 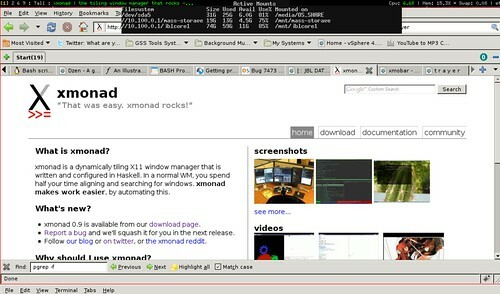 So if you haven’t heard of Jolicloud http://www.jolicloud.com/, then you need to download and install it now. 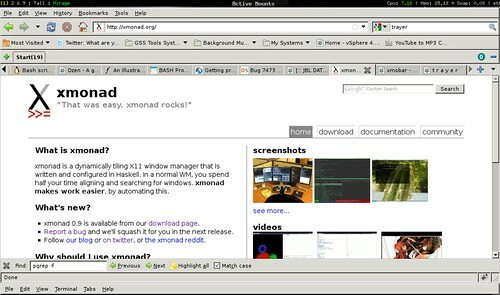 It’s an Ubuntu based OS (a self-proclaimed “Cloud OS”) specifically designed for Netbooks, and it rocks. I have Jolicloud installed on my Samsung N110 Netbook, and I use it for everything from e-mail to games (snes9x) to work (Perl/Vim/Screen). Now what makes Jolicloud super-awesome is that it treats web applications no differently from desktop applications. Each application gets it’s own icon on the “Home screen”. It’s also socially aware – it can connect to facebook and allow you to search for applications and/or people who’ve used those applications, so that you can ask them questions and get guidance on the tools you’re trying to use. The interface is very slick – big icons and a clean method of navigation to the lesser used functions of a standard Gnome/Ubuntu desktop. The most-awesomest part is that once you load up a terminal, you have full access to the command-line and all Ubuntu apt repositories. Jolicloud isn’t just for netbooks! I’ve also installed it on my Acer Veriton (similar to the Acer Revo), and am using it as a media center OS. Jolicloud also comes in an “express” edition, which allows you to install it under windows, where it will come up as a secondary OS option under the windows boot-loader. If you have a netbook, nettop, or any light-weight PC, then install Jolicloud. Highly recommended.